Though relatively unknown outside their fan group, the Greater Swiss Mountain Dog temperament is unmistakable and unmatched. Switzerland’s oldest dog breed, the Greater Swiss Mountain Dog was bred to pull carts, herd cattle, and act as protector of the house. Rounding out at over 100 pounds, the Swissies – as devotees call them – size coupled with their intimidating bark make them excellent initial watchdogs. But their sweet nature prevents them from actually following through. Although the Greater Swiss Mountain Dog’s size is quite large, they are often referred to as a gentle giant. They are both alert and fun-loving. Swissies aren’t, however, pushovers – they are confident and can sometimes be stubborn. Always on the lookout, this breed is very observant and will instantly notice when something isn’t right. Their alertness coupled with their loud bark will scare both friends and foes, but they are typically not aggressive towards strangers. Greater Swiss Mountain Dogs have incredible endurance and strength. They tend to have a long puppyhood – often reaching maturity around four or five years old. Swiss puppies are mouthy, active, and rambunctious, so they aren’t ideal for families with small children. Thanks to their herding instincts, they may not do well around smaller animals or cats but are generally friendly towards other dogs. However, with a proper introduction, this breed should be able to live harmoniously with small animals or cats. In fact, this breed takes their friendliness to the next level and does exceptionally well as a therapy dog. Since this breed was bred to be a pack leader, early training can make all the difference. Patience is key when it comes to training a Greater Swiss Mountain Dog. If you begin to teach your Greater Swiss Mountain puppy as soon as you bring them home, you have a greater chance of a manageable adolescent – and adult! Swissies respond best to positive reinforcement training – think a lot of treats, praise, and rewards. Be sure to keep training sessions fun and interesting to avoid boredom and burnout on both ends. Do you think you’re ready to add a Greater Swiss Mountain Dog to the family? First, figure out how you are going to add one to your family. Purchasing a puppy from a breeder is one option. Or, you can adopt your Greater Swiss Mountain Dog from a breed-specific rescue or even your local animal shelter! 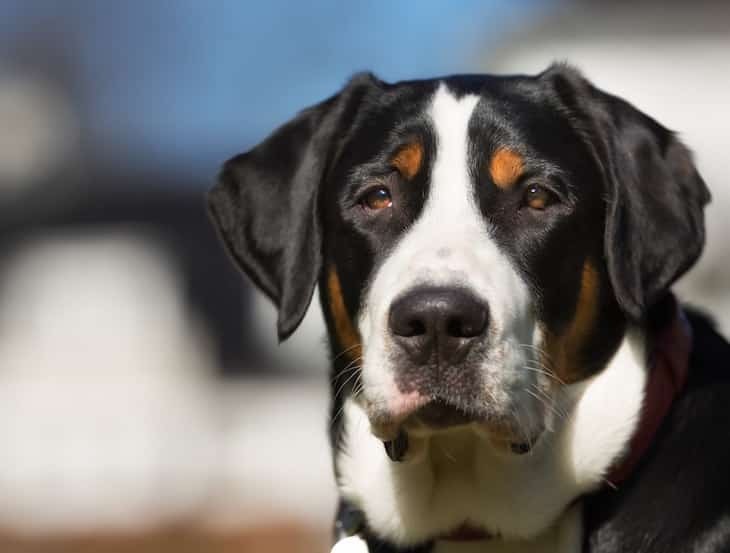 If you are thinking about adopting a Greater Swiss Mountain Dog, you can either go through a breed-specific rescue that only has Swissies, or you can search non-breed-specific rescues or shelters for Greater Swiss Mountain Dogs. A dedicated rescue group is the GSMDRF or Greater Swiss Mountain Dog Rescue Foundation. In addition to dedicated GSMD rescues, Petfinder.com and Adoptapet.com have the option to search for this breed based on location and age. Make sure to contact your local rescue to ask if they have any Swissies or Greater Swiss Mountain Dog mixes. If you are not interested in rescuing one of these pups, you can find Greater Swiss Mountain Dog puppies for sale through a qualified breeder. Check out the AKC Marketplace to find registered Greater Swiss Mountain Dog breeders. And, be sure to do your homework when it comes to choosing a breeder. Ask questions about their living conditions, how often puppies are handled, if you can meet the parents, and a copy of health records. When it comes to price, Swissies can cost between $1,500 to $2,300 depending on the location, breeder, and availability. This distinctly tri-colored breed – black, tan, and white – is as striking as they are relatively easy to groom. Swissies have a dense outer coat with a thick undercoat. The Greater Swiss Mountain Dog sheds minimally with the exception of their twice-yearly “blow outs”, meaning they shed their undercoats. Thanks to their short coat, this breed only requires weekly brushing and baths as needed. Regular nail trims, teeth brushing, and ear cleaning will keep your Swissy in tip-top shape. The Greater Swiss Mountain Dog lifespan is between 7-9 years. And OCD, or Osteochondrosis Disscans. Swissies are also prone to eye issues such as cataracts, entropion, and distichiasis. Keep in mind that not ever Swissy will have or develop these conditions. If you are purchasing from a breeder, make sure you receive all their necessary information prior to bringing your puppy home. Despite their large size, Greater Swiss Mountain Dogs only require a moderate amount of exercise. However, apartment or condo life is not ideal for this breed. As long as they have room to run around and roam – such as a large, secure backyard – they will be good to go. 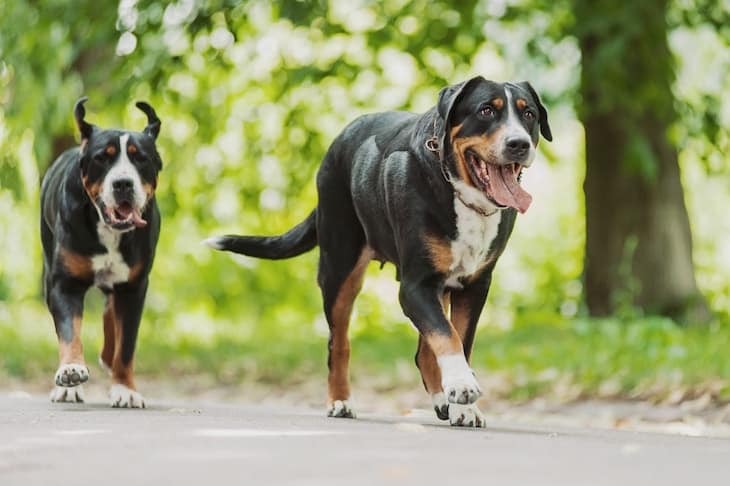 Taking your Greater Swiss Mountain Dog on your weekly hikes will not only fulfill their exercise needs but help with bonding, too. They thrive in colder climates thanks to their heritage. If in warmer climates, take proper precautions to ensure they do not overheat as they are prone to heatstroke. I think you will agree that it is hard not to fall in love with the Greater Swiss Mountain Dog Temperament traits. This sweet-natured, fun-loving dog is loyal to their family and an all-around sociable breed. Despite their large size and loud bark, they are gentle giants that may seem like good watchdogs – but are often too friendly to do anything about it! Start training early and you’ll share your home with a well-behaved, calm companion. 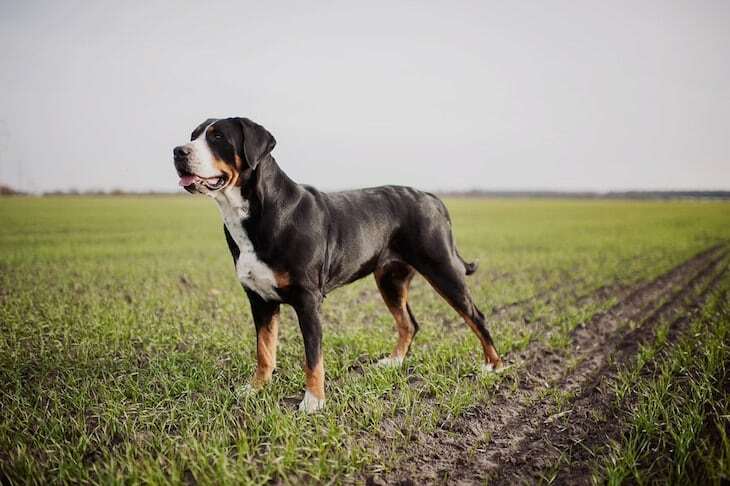 Due to their striking tri-color coat and unique features, be prepared to answer, “What kind of dog is that?” from fellow dog lovers because walks with a Swissy are bound to turn heads.